Duration: 32 sec. per ep. Studio Ghibli animated Choujuu-Jinbutsu-Giga Emaki, the famous Japanese "Scrolls of Cartoons of Birds, Animals, and People" or "Choujuu Giga" for short, for a Marubeni Power commercial. The "Encounter" commercial promotes Plan G, a new electric power option that Marubeni Power is offering to homes as Japan deregulates its power industry. 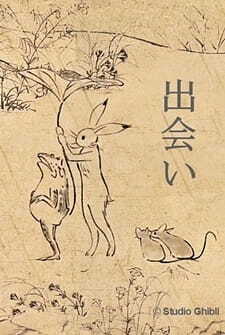 The plan derives its name from both "Ghibli" and "green." It promises to support the national trust for "Totoro's Forest," provide power for the Ghibli Museum, and promote conservation in general.